Mourners gather in Bnei Brak to pay their final respects to the late Rabbi Aharon Leib Shteinman. A crowd numbering in the hundreds of thousands gathered in Bnei Brak Tuesday, forming a massive funeral procession which made its way from the late rabbi's home at approximately 12:00 p.m. to a local cemetery. 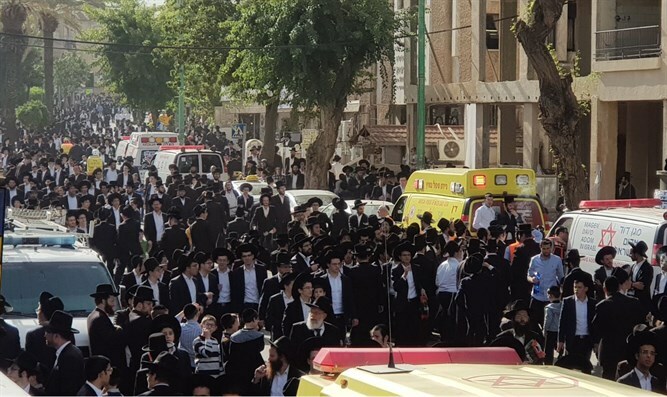 Mourners filled the streets around 5 Chazon Ish Street hours after the passing of Rabbi Aharon Yehuda Leib Shteinman at Maayanei Hayeshua Hospital in Bnei Brak. Rabbi Shteinman, who was 104 at the time of his passing, was a Torah luminary and leading decisor of Jewish law, one of the most widely respected figures in the haredi religious world. A senior member of the Council of Torah Sages advising the Degel Hatorah party, Rabbi Shteinman also served as dean of the Ponevezh Yeshiva in Bnei Brak. He was considered the leader of the Litvish yeshiva community and is the last of his generation's leaders, which included the late Rav Elazar Shach and Rav Yosef Shalom Elyashiv zts"l.
Officials at the Maayanei Hayeshua Hospital in Bnei Brak noted earlier Tuesday morning a significant deterioration in the rabbi's condition. The rabbi underwent CPR this morning by the medical staff which apparently managed to restore his pulse. Prof. Ravid, who had been treating the rabbi, made it clear that his condition was critical, and that medically, "there is nothing more to be done." Shortly after the hospital released the statement, Rabbi Shteinman passed away. At the beginning of last month, Rabbi Shteinman, 104, was hospitalized for a week, at the end of which he was released to his home under the supervision of his personal physician. Funeral organizers announced Tuesday morning that the funeral procession would leave the rabbi’s home at 5 Chazon Ish Street in Bnei Brak at 12:00 p.m. As per Rabbi Shteinman’s request, and as befitting the humble Torah genius who lived in a simple, unpretentious home which he would not allow to be refurbished - and there was no shortage of people wiling to do that for him - no eulogies will be said during the funeral service. Rabbi Shteinman left instructions that he was to be buried within six hours of his death. The rabbi will be laid to rest in the Ponevezh cemetery in Bnei Brak, next to his wife’s grave.